Home→Custom Built→Fresh out of the fire. Fresh out of the fire. Well the fire of the torch anyhow. 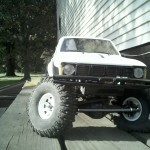 Another Keystone RC custom one off bumper. 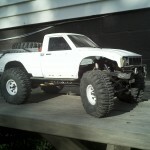 This was built for member Josh_Br’s new SCX10 Hilux that he is running for the winter comp series. 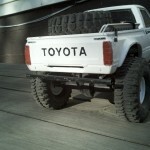 I made both the front and back bumper. The idea was to keep it simple and to resemble as though someone had taken some old well casing and welded it up for a bumper. 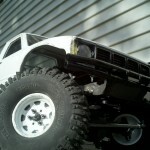 He will be running a servo winch which resembles a hidden winch. 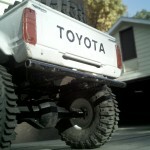 This keeps the bumper from sticking out far and hitting on obstacles. 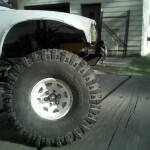 You will notice that the front tires can actually make contact before the bumper does. 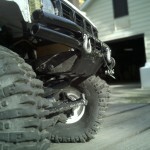 The D ring shackles give it a winch point if needing a tow over something. 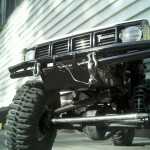 The under skid is bolted to the frame rails and offers protection for the chassis mounted servo. 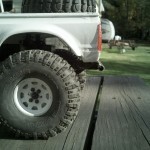 The skid is angles to help it slide up over obstacles. 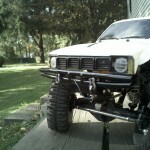 This type of custom would goes for about $40 for the front bumper and $15 for the rear. Ryan, the bumpers look awesome. You did a great job understanding what I had in mind and bringing my ideas to fruition. Thanks!